Amorosa at Cibolo Canyons is an active lifestyle neighborhood within the Cibolo Canyons master-planned community in San Antonio, Texas. This gated community boasts 2,100 acres of picturesque landscape and 207 acres of nature preserves that provide residents with a peaceful retreat surrounded by natural beauty. Offering a carefree lifestyle with resort-style amenities as well as quality home designs and a vibrant social atmosphere, Amorosa at Cibolo Canyons is an ideal place for active adults in Central Texas. Ideally situated in the tranquil Texas Hill Country and just minutes away from downtown San Antonio provide homeowners with endless options for recreation, attractions, and entertainment. Regarded as a golfer's paradise, residents are close to two PGA Tour Tournament Players Club golf courses, which were designed by acclaimed architects Pete Dye and Greg Norman. 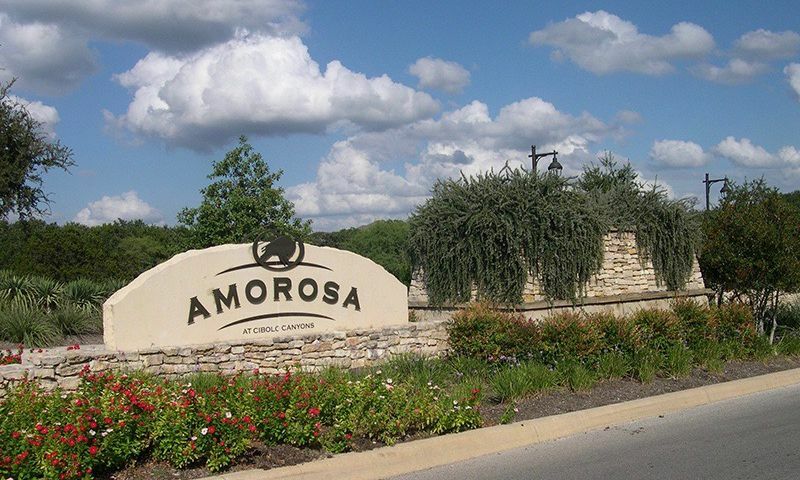 Residents of Amorosa have access to all of the master-planned amenities within Cibolo Canyons. The Cibolo Canyons 6,630 square-foot Amenity Center features state-of-the-art facilities that keep homeowners physically fit and socially engaged throughout the year. The community's indoor amenities allow residents to mingle in the meeting room or stay in shape by visiting the fitness center or aerobics studio. Outdoors, active adults can spend their days enjoying the Texas climate by swimming in the Olympic-size pool or sunbathing on the patio. When the grandkids come to visit, they can take them to the water park for a fun splash or play a few games on the soccer field. A playground is also available for spending quality time with them. In addition to these great recreational areas, Amorosa at Cibolo Canyons also has 207 acres of nature preserves and miles of scenic walking and biking trails, perfect for leisurely strolls throughout the neighborhood. Construction of Amorosa at Cibolo Canyons began in 2012 and will consist of 135 single-family homes upon completion. Builders Sitterle Homes and Imagine Homes are bringing their innovative, energy-efficient designs as well as upscale features and luxurious finishes to this community. Active adult homebuyers will love the floor plans offered by both builders because of their maintenance-free exteriors and open layouts. Sitterle Homes offers nine distinct single-family floor plans that range in size from 1,826 to 2,507 square feet. They have two or three bedrooms, two to three-and-a-half bathrooms, and an attached two or three-car garage. These single-family homes are designed with elegant master suites, inviting living areas, gourmet kitchens, and low-maintenance exteriors. Imagine Homes has single-family floor plans from its Discover Series that offer 1,906 to 2,485 square feet of living space. They have two or three bedrooms, two orthree-and-a-half bathrooms, and an attached two or three-car garage. All homes feature one-story living, energy efficient designs, high ceilings, Whirlpool kitchen appliances, granite kitchen countertops, ceramic tile flooring in bathrooms, and low-maintenance exteriors. The Theatre Series by Imagine Homes consists of six single-family floor plans ranging in size from 2,201 to 3,337 square feet. They have two to four bedrooms, two-and-a-half to four-and-a-half bathrooms, and an attached two or three-car garage. Homes from this series are one or two stories and feature energy-efficient construction, open layouts, gourmet kitchens, elegant master suites, formal dining areas, and covered patios. This energetic community offers a great selection of clubs, activities, and events that provide a welcoming atmosphere for all residents to enjoy. Amorosa hosts special events like annual food drives, holiday parties, national night out, jog-a-thon, and casino nights that bring residents together in a friendly setting. Homeowners can attend classes to learn about first aid and CPR techniques. Or they can work out with friends by joining water aerobics, Pilates, yoga, or Zumba groups. With so many events and activities, homeowners will have no trouble keeping their social calendars full all year long. Amorosa at Cibolo Canyons is located in San Antonio, Texas, and is just off the TPC Parkway. It is part of the master-planned community named Cibolo Canyons. Major roadways include Highway 281 and Interstate 35 that make driving around town a breeze. A stone's throw away from the community are several golf courses including Tour Tournament Players Club San Antonio and Canyon Springs Golf Club. Plenty of shopping options are nearby including Sam's Club, Target, Home Goods, and Village at Stone Oak. Residents are about 25 minutes away from downtown San Antonio where they will find endless options for big-city attractions, shopping, dining, and entertainment. The famous Riverwalk features upscale to casual restaurants as well as retail shops. History lovers can visit the Alamo and learn about Texas' most famed battle, while sports fans can check out a basketball game or other sporting event at the Alamodome. Active adults looking for a vibrant community with resort-style amenities and beautiful homes set in a prime location should check out Amorosa at Cibolo Canyons in Central Texas. Cibolo Canyons Amenity Center - 6,630 Sq. Ft. There are plenty of activities available in Amorosa at Cibolo Canyons. Here is a sample of some of the clubs, activities and classes offered here. Sitterle Homes offers nine distinct single-family floor plans that range in size from 1,826 to 2,507 square feet. They have two or three bedrooms, two to three-and-a-half bathrooms, and an attached two or three-car garage. These single-family homes are designed with upscale features, energy-efficient construction, and low-maintenance exteriors. Please Note: Floor plans are not available at this time. Imagine Homes has single-family floor plans from its Discover Series that offer 1,906 to 2,485 square feet of living space. They have two or three bedrooms, two to three-and-a-half bathrooms, and an attached two or three-car garage. All homes feature one-story living, energy efficient designs, high ceilings, Whirlpool kitchen appliances, granite kitchen countertops, ceramic tile flooring in bathrooms, and low-maintenance exteriors. Please Note: Floor plans are not available at this time. The Theatre Series by Imagine Homes consists of six single-family floor plans ranging in size from 2,201 to 3,337 square feet. They have two to four bedrooms, two-and-a-half to four-and-a-half bathrooms, and an attached two or three-car garage. Homes from this series are one or two stories and feature energy efficient construction, open layouts, gourmet kitchens, elegant master suites, formal dining areas, and covered patios. Please Note: Floor plans are not available at this time. 55places.com is not affiliated with the developer(s) or homeowners association of Amorosa at Cibolo Canyons. The information you submit is distributed to a 55places.com Partner Agent, who is a licensed real estate agent. The information regarding Amorosa at Cibolo Canyons has not been verified or approved by the developer or homeowners association. Please verify all information prior to purchasing. 55places.com is not responsible for any errors regarding the information displayed on this website.